LCL knee injury can sideline an athlete for longer periods of time if not treated properly. LCL (Lateral Collateral Ligament) is one of the four knee ligaments that hold the knee in place. 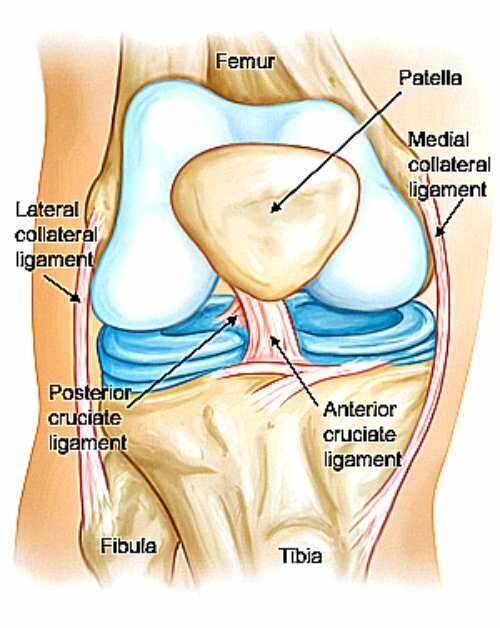 LCL ligament is located opposite of the MCL (inside knee ligament). Unlike the MCL, which connects femur and tibia, LCL ligament connects femur with a smaller bone in the lower leg called Fibula. LCL knee injuries will occur with impact to the inside of the knee, causing the outside ligament (LCL) to bend and stretch. This leads to ligament sprain, or a complete tear. LCL knee injuries will happen to athletes more often, especially soccer players, due to constant change of direction and sudden stops, through 90 minutes of the game or practice. Soccer players will injure their LCL ligament by running and suddenly stopping, where the planted foot stays in one place while the body keeps moving. This causes the knee to bend the LCL ligament, causing LCL sprain, or a complete ligament tear. Symptoms that point towards a sprained or torn LCL ligament will be: sharp pain to the outside of the knee, inability to bend the knee, swelling on the outside of the knee, and instability of the knee. When an LCL knee ligament injury occurs, player will feel as if the knee is giving away and buckling when trying to walk. Due to the anatomy of the knee, inside knee ligament MCL, is more prone to injuries than the outside LCL knee ligament. Injuring any knee ligament may lead to injuring other knee ligaments or joint structures. LCL knee ligament injuries are graded on severity scale I, II, or III. Grade I LCL ligament injury happens when the player mildly stretches the LCL ligament, causing mild pain to be felt when putting pressure on the injured leg. No swelling, or very minimal swelling will be noticeable on the outside of the knee. Range of motion will not be effected and players will simply feel discomfort on the outside of the knee when walking, running and especially changing directions. Grade I LCL ligament injury can lead to more severe injury if the athlete keeps playing, without letting the ligament fully heal. Athletes should take 1 - 2 weeks away from doing any activities that involve running. RICE Method (Rest, Ice, Compress, Elevate) will help in proper healing of the LCL ligament. Grade II LCL knee injuries happen with more severe stretching of the LCL ligament, making it feel very loose and painful. Pain and swelling is a lot more severe and the knee will feel unstable when walking. Running will not be possible without a very noticeable gimp present. This LCL ligament injury will require 3 - 4 weeks of rest. RICE Method (Rest, Ice, Compress and Elevate) to treat the injury and accelerate healing process. Knee brace should be worn when waling to help stabilize and compress the injured ligament. Third degree LCL ligament injury happens when the LCL ligament is stretched to the point where it is completely torn. Third grade LCL ligament injury will follow with swelling, severe pain to the outside of the knee, inability to bend the knee, and instability or giving out (buckling) of the knee. In most cases surgery will not be required, and ligament tear is treated by wearing a knee brace. This injury of the knee will take a minimum of 6 - 8 weeks to heal properly. Treatment begins by letting the pain subside, than working on the range of motion, followed with strengthening of the knee ligament before returning to sports and activities. Knee brace needs to be worn to stabilize and compress the injured knee ligament. As with any injury that may be considered Grade III severity, Doctor should be consulted to fully assess the damage done to the knee. Grade III injury may also injure other parts of the knee, so professional opinion is very important for the long term health of the knee. For more information on knee injuries take a look at Different Knee Injuries.